I’ll walk through each of these below. To uses its full name, it’s actually the SimpliVity OmniStack 3.0 Data Virtualization Platform (DVP). The DVP acts as a layer of abstraction between the hypervisor and the storage hardware and runs SimpliVity’s data deduplication, compression, and snapshot-based data protection. The improvements to the OmniStack DVP are in the areas of ease of deployment, performance, and data protection. OmniStack 3.0 adds automatic multi-site network discovery. This allows an OmniStack solution to automatically detect the underlying network topology (e.g. : mesh, hub and spoke), and to detect any other OmniStacks running on the network, automatically joining them into a Federation without requiring any user input. Previously, OmniStack didn’t support a hub and spoke Federation topology. Hub and spoke is seen in many organizations that have a main centralized data center and several remote or branch offices. Expanding OmniStack Federations to support the hub and spoke topology enables its use as a ROBO solution. Additionally, the OmniStack Deployment Manager has been enhanced. In 3.0, the Deployment Manager is able to perform parallel deployment of multiple nodes. In previous versions, administrators would deploy one node at a time, adding them to the Federation one by one. To further improve the deployment process, OmniStack 3.0 allows the use of a configuration file for deployments, minimizing not only manual data entry, but also the chance for adding human error to the configuration process. Combine this functionality with auto-discovery and new nodes can be automatically added to the Federation by simply powering them on. The Deployment Manager allows deployment using either Standard vSwitches or Distributed vSwitches. In 3.0, the Deployment Manager will perform automatic configuration of the vSwitch, ports, and Port Groups (this was a manual process in previous versions). OmniStack 3.0’s I/O handling has been enhanced with the highly-consolidated single-site environment in mind. This ties into the continuing ROBO solution theme. Customers running virtualized applications can expect an up to 30% performance increase for workloads with high I/O that want low latency, like MS Exchange and MS SQL Server – as compared to the same workloads virtualized on previous versions of OmniStack. OmniStack 3.0 adds a few improvements to SimpliVity’s snapshot-based data protection. The first set of enhancements is in the management of the snapshots. In a long-overdue enhancement, 3.0 allows the ability to edit and modify snapshot policies. Prior to this version, if you wanted to change a snapshot policy, you needed to delete the policy and recreate it from scratch with the new settings. Another welcome change is that snapshot retention times can now be modified after the snapshot’s creation. (In this case, “retention time” may be misleading. In practice, a SimpliVity snapshot’s “retention time” really means “time until this snapshot is automatically deleted”.) Also, manual snapshots can now have a retention time set at the time of creation. In previous versions, manual (or unscheduled) snapshots needed to be explicitly (and manually) deleted. For administrators who prefer the use of scripting over the use of a GUI for handling their snapshots, OmniStack 3.0’s CLI has been enhanced with additional capabilities to give more options and greater control. For me, the most exciting data protection enhancement is the ability to restore individual files within the Guest OS of the VMs. In previous versions, the finest level of granularity for a restore was an entire VM. The administrator right-clicks on the snapshot they want to restore from. The admin chooses “Restore Files/Folders…” from the menu that pops up. The admin selects the VM to get the file(s) from. The admin selects the file(s) and/or folder(s) to restore. 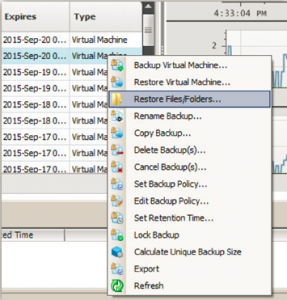 The admin selects the VM to restore the files to – which doesn’t necessarily need to be the VM the files were on originally. OmniStack will then take the resulting restore fileset and present it as a virtual DVD ROM image that will be automatically mounted to the VM the admin chose. The files can then be copied from within the Guest OS. This is a great feature-add that I’m really happy to see. Another part of today’s announcement was the availability of a new OmniCube form-factor, the CN-1200. 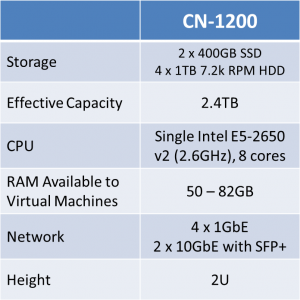 As you might imagine from the lower model number, the CN-1200 is a smaller configuration than the other OmniCube offerings. The CN-1200 was specifically designed to be deployed as part of a remote office / branch office (ROBO) solution. 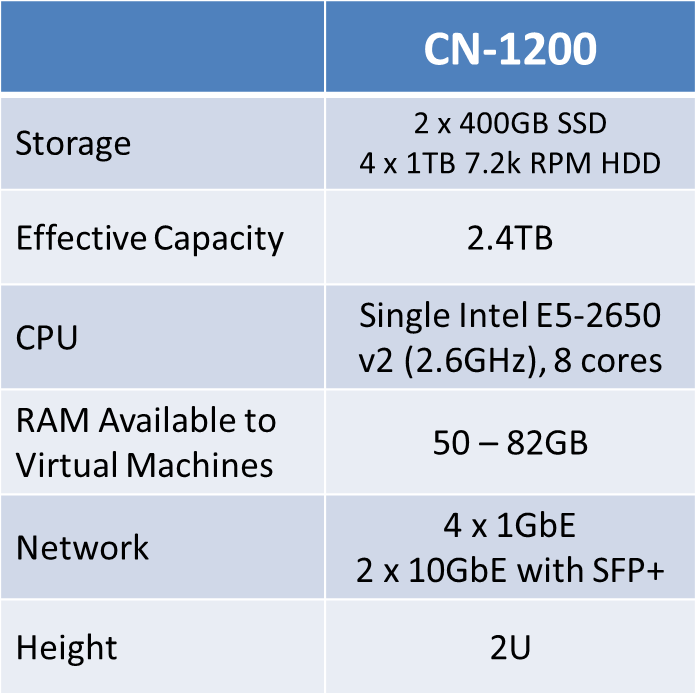 The CN-1200 specifications are in the table below. You’re right, of course. This is a great idea for a ROBO solution. The OmniCubes in each remote or branch office can be managed from the central data center. The data protection policies can be set to store copies of the remote offices’ snapshots on the central data center’s OmniCubes. With the global data deduplication used by SimpliVity’s Data Virtualization Platform, the branch offices won’t need a lot of network bandwidth even if the snapshot policy is set to run multiple times a day (e.g. : Hourly). Put it all together, though, and I know what I’ll be positioning the next time a customer asks me about a ROBO solution. What’s a “hyperguarantee”? It’s a cute marketing name for performance guarantees for a hyperconverged infrastructure solution. I see it as partly a poke at other converged infrastructure solutions (hyper- or not), and partly as a demonstration of SimpliVity’s willingness to stand by their claims. HyperEfficient: 90% capacity savings across all storage, including backup. HyperProtected: 60 seconds or less on average for local backup (snapshot) or restore of a 1TB VM. HyperSimple: three clicks to backup, restore, clone, or move a VM from a single console. HyperManageable: 60 seconds or less on average to create or update backup policies for 1,000s of VMs across dozens of remote sites from a single console. HyperAvailable: Add or remove a local or remote SimpliVity system without downtime, without interruption to local or remote backups, and without reconfiguration of backup policies or IP addresses. SimpliVity has added the five points of this guarantee to the new terms of their standard warranty. This isn’t a stunt. This is “performs as advertised or your money back”. The CN-1200 is orderable today. It will begin shipping during the first week of September. OmniStack 3.0 is GA today, but only on new OmniCube shipments and special cases in the field. 3.0 for OmniStack on Cisco or OmniStack on Lenovo will be available in Q4 of this year. Customers with existing installs will be able to upgrade to OmniStack 3.0 in Q4 of this year. This entry was posted in SimpliVity and tagged Announcement, Hyperconverged, OmniCube, OmniStack, ROBO, SimpliVity, Virtualization. Bookmark the permalink.